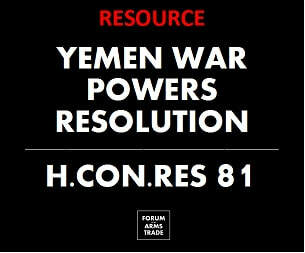 On September 27, 2017, House Concurrent Resolution 81 (H.Con.Res 81) was introduced, "Directing the President pursuant to section 5(c) of the War Powers Resolution to removed United States Armed Forces from unauthorized hostilities in the Republic of Yemen." The bipartisan measure, was offered by Ro Khana (D-Calif) with three original co-sponsors Thomas Massie (R-Ky), Mark Pocan (D-Wis), and Walter B. Jones, Jr (R-No.Car.). It has garnered 50 co-sponsors as of January 16, 2018.. The resolution specifically calls out U.S. targeting assistance and refueling for Saudi and UAE warplanes that have engaged in the war in Yemen, where a humanitarian crisis now exists with millions facing starvation. U.S. President Donald Trump has announced large arms sales for Saudi Arabia that have at times generated significant Congressional opposition. H.Con.Res. 81 does not limit U.S. forces active against Al Qaeda in the Arabian Peninsula (AQAP). In a political compromise, a non-binding resolution H.Res 599 (text) passed in the House of Representatives on Nov 13, 2017 by a vote of 366-30 that includes: "Congress has not enacted specific legislation authorizing the use of military force against parties participating in the Yemeni civil war that are not otherwise subject to the Authorization of Use of Military Force (Public Law 107–40) or the Authorization of Use of Military Force in Iraq (Public Law 107–243)"
In late 2018, it appeared the resolution might be brought up as the Senate reconsidered and passed it's version the resolution (S.J. 54), but steps taken elsewhere prevented that from occurring. ​Forum-listed experts to contact on this subject include Kate Kizer (Win Without War), Stephen Miles (Win Without War), William Hartung (Center for International Policy), Kate Gould (Friends Committee on National Legislation), N.R. Jenzen-Jones (ARES, on technical queries). "Stop the Unconstitutional War in Yemen," Opinion by Ro Khana, Mark Pocan, Walter Jones. New York Times, October 10, 2017. Letter from 65 organizations expressing support for resolution, October 27, 2017. Interview with Ro Khana and Kate Kizer moderated by Stephen Miles, Facebook Live video, October 31, 2017. ​"H.Con.Res.81 is Congress' opportunity to end the US role in the suffering of millions of Yemenis, and to end US complicity in ongoing war crimes committed by the Saudi-led coalition in its intervention in Yemen's civil war. It's absolutely absurd that House Leadership would bend the rules and potentially break the law so the US can continue helping Saudi Arabia and the UAE kill and starve civilians in Yemen. Demanding a debate and vote on H.Con.Res.81 is the first step in re-asserting Congress' role as the sole body that can declare war, and in ending the contradictory US policy of quite literally fueling the conflict while calling for a political settlement in Yemen's civil war." "U.S. support for Saudi Arabia and the UAE's war in Yemen is the poster child of what's wrong with American foreign policy. Thanks in part to American military assistance, the Saudi-led coalition's war in Yemen has brought about the largest humanitarian crisis on the planet under the absurd belief that more bombs would somehow bring peace. It's time for Congress to do its job and stop this insanity." "This week's vote in the House to end U.S. support for Saudi Arabia's brutal war in Yemen is valuable in its own right, as a step towards ending the Saudi regime's indiscriminate bombing campaign and the resulting civilian casualties. It is also a chance for Congress to take a stand against the seemingly endless wars the United States has engaged in during this century, most of which have not been appropriately authorized by the Congress. It's long past time for the United States to stop supporting a war that independent human rights organizations believe may involve war crimes on all sides. Continuing down this path will not only risk implicating the United States in these violations of the laws of war, but it will foster resentment that will make it easier for groups like Al Qaeda in the Arabian Peninsula (AQAP) to garner support. Continuing to support the Saudi-led coalition in Yemen is a disaster for security in the region. It also runs contrary to the long-term interests of the United States."